« Reliving My Childhood: Visiting Durango, riding the Durango & Silverton Railroad. One of these is not like the others…. 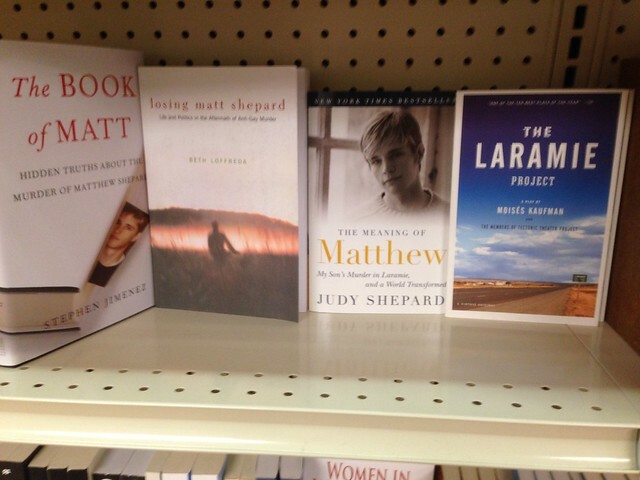 These last three books are all about Matthew Shepard’s murder – The first written by a University of Wyoming professor, exploring the politics of sexuality are playing out in the wake of Matthew’s murder. The second, written by Matthew Shepard’s mother, takes a very personal look at his murder, while the third is a play built from interviews with local citizens. The first is a hack job written by somebody who claims that Matthew Shepard’s murder was nothing but a meth deal gone bad – or something to that effect. On the one hand I think that lunatics have the first amendment — Stephen Jimenez is more than welcome to think and write whatever he wants to when it comes to Matthew Shepard’s murder, just like member of the Westboro Baptist Church have the right to protest everybody’s funeral. The first amendment is a critical part of keeping our rights and society moving forward and anything that is done to abridge it, offends me. On the other hand, the University of Wyoming bookstore manager made a choice when s/he decided to stock the book and place it on the shelf of the store – thus giving the book some amount of implicit approval from the university. So… I guess I am annoyed. Bad Behavior has blocked 426 access attempts in the last 7 days.